This page is a transcription of a booklet printed by G. Falkner and Sons in Manchester to accompany an exhibition held by Cassidy at his studios in Lincoln Grove, Manchester. The 'small collection' comprises 100 works, of all shapes and sizes, some of them finished, others are sketches for proposed works, and unfinished projects. The document is not dated, but from press reports we know it took place in June 1914. CAPTAIN SCOTT AND HIS GALLANT MEN [no.31]. The process of creating sculpture allows the existence of more than one copy of a work, so the items exhibited may not be the same copies we have described elsewhere on the site. Very few of the entries actually relate to anything we yet know about from other sources; it would be interesting to know if any of them still exist. 'The Weaver's Wife', No. 7, is known to survive in several versions; the notes below point to some others that we know about and can be found elsewhere in our site. THE LATE G.C. GREY, ESQ [no.54]. The exhibition included sketches or early versions of well-known works such as Adrift (no.41), King Edward VII (no. 35 and 39) and Mrs Rylands (no. 46) all dating from 1905 - 1913. 'The Door of Knowledge' (no.37, illustrated opposite) appeared at an auction sale in London in 2007. This work, seven feet high, appears to have remained in Cassidy's studio until its enforced closure in 1928, and is believed to have come to the 2007 sale from a house in the Manchester area. 'The Miner' (no.5 - above) appears be an additional casting made from the model for the John Kay memorial of 1908, and 'The Reaper' (no.6) may also be from the same source. No.86, F.R. Benson, is believed to have been commissied by the Royal Shakespeare Company. No. 62, Sketch for a Boer War memorial, is of interest. The South African, or Boer, War of 1899-1902 was one of the first in British history to result in war memorials of the type that became common in later years, distinct from the long-standing tradition of raising statues to Generals. The Manchester Regiment memorial, which stands in St Anns Square, is by William Hamo Thorneycroft, chosen by committee from a list which included Cassidy; at the time the choice of sculptor created some controversy as there was a vocal lobby for the local man Cassidy to be chosen. However, Cassidy was apparently commissioned privately by his supporters to produce his own version, which was shown at the Royal Academy in London in 1905. It subsequent history has not yet been discovered. By 'B.D.T.' From the Manchester Guardian, 16 June 1914, p.20. 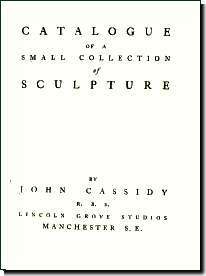 An exhibition of Mr. John Cassidy's sculpture is to be open for the next ten days at his studio in Lincoln Grove, off Plymouth Grove, Manchester. It contains, in all, about one hundred pieces - in terracotta, plaster, bronze, stone, and marble, a few works in clay, stone, and alabaster being shown in different stages of progress. The artist has experimented freely at various times with materials, trying first one and then another with considerable enterprise; and he has also attempted in a number of his works to get away from some of the conventions usually followed both in choice of subject and in treatment. The latter departures have not always been happy. However simple it seems in theory, the literal rendering of everyday life is very difficult to manage with success in sculpture; and, on tbe other hand, narrative or elaborate allegory is apt to sink into melodrama. Mr. Cassidy, in some of his works, runs to one or other of these extremes, tending sometimes to be over-literal in his work from life and to be melodramatic in imaginative compositions. The two tendencies are really due to the same cause. The compositions are often vigorous and happy in the first sketch. In the finished group the details are worked out too carefully from life; so that the whole, instead of being heroic and unified, is in danger of becoming a collection of flgures, each too much individualised. relief, "After the Crucifxion," is really extremely good; another relief panel, designed for a book-plate, is also very well treated. A large relief portait of Dr. Schunck is, again, excellent in its realisation of character in a profile; another relief portrait (38), near by, is even better in this respect. In the busts, too, the rendering of the profile is often very expressive, as in that of a man called "The Roadmender." The attempt to combine a familiar easiness of pose with sculpturesque quality succeeds best in a little statuette of the late W. P. Frith. R.A.
Other things among the best are "The Tide," "John Kay," "The Captive," "The Weaver's Wife," in bronze; "Queen of the May," in marble; a bronze panel of "Commerce," in which the relief treatment is, again, good; and some jolly stone garden ornaments. Portraits are shown of a number of well-known Manchester citizens. Several of the pieces have been shown at the Salon, the Royal Academy, and other exhibitions. Information about the whereabouts of any of the works listed will be very welcome at the email address below. Note: This catalogue first came to our attention as a photocopy, kindly supplied by Nicholas Wall of the Slane Historical Society, on which the first version of this page was based. Since then we have had access to an original in the archives of the Manchester Academy of Fine Arts, and a newspaper review of the exhibition. This updated page includes that review as well all the text and pictures from the 20-page original catalogue. 7. The Weaver's Wife, bronze. 8. "The Tide." Summit of a Timepiece, bronze. 9. The Shepherd Boy, bronze. 10. Romeo and Juliet, bronze. 11. The late E.J. Broadfield, medallion, bronze. 12. Dr. Schunck, medallion, silver. 13. Dr. Kenrick Pyne, medallion, silver. 14. The late Cardinal Vaughan, bust. 15. 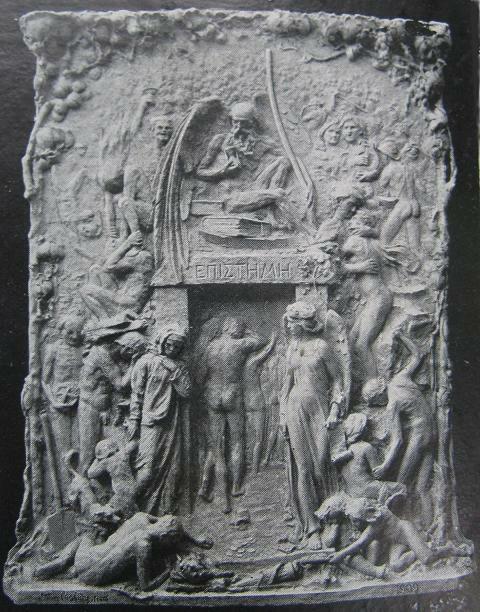 After the Crucifixion, relief. 16. Love is Dead, bronze. 18. Portrait of a Lady, bust, bronze. 19. The Quaker's Daughter, bust, fired clay. 20. 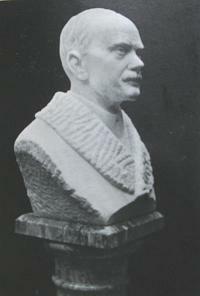 Sir Alfred Hopkinson, K.C., bust. 21. John Kay, the inventor of the fly shuttle, bronze. 23. The late George Potter, R.C.A., head. 24. Defending the Flag, bronze. 25. Statuette of a Lady, fired clay. 26. Sketch for Garden Group, in stone. 27. Sketch for Garden Group, in stone. 28. "May Morn," marble head. 29. Hosting the Flag, sketch for centenary group. 30. The Mill Girls, group, fired clay. 32. Birds of the Stone-age, group, garden figure. 32A. Birds of the Stone-age, group, garden figure. 33. "Night," stone, garden figure. 34. "Morning," stone, garden figure. 35. Model for Statue of King Edward. 36. Memorial Panel for Bury Grammar School. A gate, rugged and stern of structure, is the centre of the composition--The Door of Knowledge--through which the spirits pass into the outer world. Above the portal Father Time sits throned on volumes of Mystic Lore, closed and clasped to all who have not passed the doorway. Round about it a multitude of figures symbolise the life of Man, its development and decline, and two symbolic trees frame the whole. On the right is the Fruitful Vine, figuring the exuberance of youth; on the left maturity and declining years, experience and reflection are symbolized by the Tree of Knowledge, the Apple. At the gateway lies a half-extinct torch, dropped by one of the figures that have left this world behind, and a winged being -- Youth -- borrows Light from it. The right side of the piece is filled with strong and slender forms, personifying Life, its Help, Affection, Love, Music and Labour. A Sower scatters seed, a Soldier is seen fighting, and so the figures mingle and merge into a vague crowd around and about the patriarchal figure of Time. Downward, on the left, it suggested Ripeness of Maturity, Wild Revel, Wretchedness, Despair. The Worn, the Burdened, the Blind, the Crushed are seen here, and the abandoned spade has fallen from enfeebled hands, whilst at the edge of the Gateway, leading a reluctant Child towards that "Goal of all Mortal," stands the figure, veiled and osseous, of Death, faced across the opening by the thoughtful form of the Recording Angel, scroll and pen in hand. 38. Portrait in Relief, heroic. 39. Colossal Head of King Edward. 40. Sketch for a Monument to a great benefaction. 41. Original Sketch for the heroic group, "Adrift." 42. Sir Alfred Hopkinson, K.C., statuette. 43. Portrait of a Lady, unfinished. 44. The Rescue, clay sketch, unfinished. 45. The Whisper, clay sketch, unfinished. 46. Model for the Marble Statue of the late Mrs. Rylands. 47. The late E.J. Broadfield, bust. 48. The late Dr. Schunck, bust. 49. Sir George Pilkington, D.L., bust. 50. Portrait of a Lady, bust. 51. George Milner, Esq., M.A., bust. 52. The late Alderman Harry Rawson, bust. 53. The late Samuel Ogden, Esq. J.P., bust. 54. 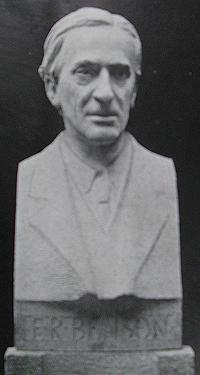 The late Mr. Grey, Secretary of the Co-operative Society, bust. 55. The late Alderman Sir James Southern, bust. 56. The late W.P. Frith, R.A., M.V.O., statuette. 57. Sketch for a Monument to Wolf Tone. 58. . . . The Peacemaker. 59. . . . The Peacemaker. 61. Portrait of the late Dr. Schunck, medallion. 62. Sketch for a Boer War memorial. 63. "Margaret Gray," terra-cotta head. 64. "The Road-mender," terra-cotta head. 68. Design for a bell-push, unfinished, Bronze. 69. The Golden-age, pearl alabaster. 70. The Flood, unfinished group in clay. 74. The late James Gresham, Esq., medallion. 75. The late Queen Victoria, medallion. 76. The Whirlpool, clay sketch. 77. Portrait of a Lady, in stone, unfinished. 78. Portrait Head of a Lady, unfinished. 79. Sketch for a Clock Mantelpiece, terra-cotta. 80. Sketch for Reaper, fired clay. 81. Jupiter sketch, fired clay. 82. Sketch for a late M.P., statuette. 83. Ernest Marriott, Esq., portrait statuette. 84. The late Mr. Christie, model for bronze. 85. The late Mrs. Christie, model for bronze. 87. The late King Edward, model for bronze bust at Salford. 88. The Grandfather and the Orphan, sketch in clay. 89. Sketch Group for Monument, in clay. 90. The Spirit of Light, life-sized lamp figure. 91. R.B. Fishenden, Esq., portrait head. 93. Model for Overmantel, in music room. She is seated on bales of goods upon a raft, attended by the Arts. The genius of Enterprize trims her sail, which is decorated with Mercury's winged distaff. The sail is filled and pressed forward by favouring Winds, while flower-bearing Zephyr adds pleasure to her pursuit. The raft is borne onward by the Tides, and steered by Capital, who keeps an anxious outlook for the Markets. 95. W.P. Frith, Esq., R.A., bust. 96. Sketch for "Fame," fired clay. 97. The Girl Worker, fired clay. 98. Design for Fountain, clay. 100. 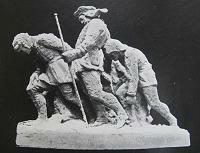 Sketch for a Monument, with group representing Charity on the Summit. Page compiled by Charlie Hulme, January 2010, Updated July 2011.